One of the key focuses when operating a business is creating and maintaining a sense of safety for your patrons. While deploying security officers is the obvious solution, there is no guarantee that the officers will carry out their duties on time, regularly or at all. The Active Track does away with this shortcoming. This is showcased by a popular city theatre which insisted that its security service provider use Active Track devices on site. With theatre productions being performed throughout the day and late into the evenings, the trustees wanted proof that its patrons would be safe at any given time, instead of relying solely on the security service provider’s assurances. To give effect to this instruction, the security service provider issued each of its security officers with an Active Track unit. After a training session on the device, the units were deployed and put to work. The Active Track’s built-in RFID reader allowed the security officers to check in at the various scanning points set up by the security service provider. The GPS functionality, combined with the GSM capabilities, ensured that the precise location and time of each scanning event was recorded in real-time. The data captured by each Active Track was available to both the security service provider and theatre management remotely and in real-time, via Active View – the Active Track’s online portal. The data is available in numerous formats to suit the needs of the various users. These included daily and weekly patrol reports, real-time monitoring of patrols being carried out, and reports setting out the rates of success of the security officers’ patrols. By relying on the GSM capabilities, the security service provider put alerts in place to be activated in the event of a late or missed patrol. In this way, when a security officer missed a check-in point or patrol, the event would be flagged on Active View and an automated notification would be sent to the service provider and theatre’s designated recipients via SMS and email. In response to this notification, the security service provider would call the security officer in default via the Active Track and determine the reason for his failure to carry out his duties. This was shown to have assisted the service provider in putting an end to officers sleeping on duty, instituting the necessary remedial action in response to breach of duties by security officers, and rendering an improved security service overall. 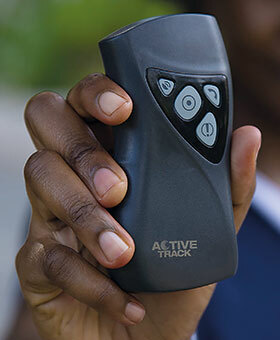 While its main advantage as a monitoring tool has been made clear, the Active Track can also be used to assist security officers in panic or distress situations. If an emergency arises, the security officer can activate the built-in panic button. This triggers an automated SMS to the security service provider, and an alarm in the Active Track 24-hour call centre. The call centre responds by calling the device to determine the nature of the emergency, and what action needs to be taken. If the emergency is such that a panic button cannot be triggered, the security officer can activate the shock sensor by dropping the device. This action alerts both the security service provider and call centre of the distress situation. The call centre will place a silent call through to the device and listen in on the situation, and notify the security services provider of the events on site, thereby enabling the security provider to take swift and appropriate action.